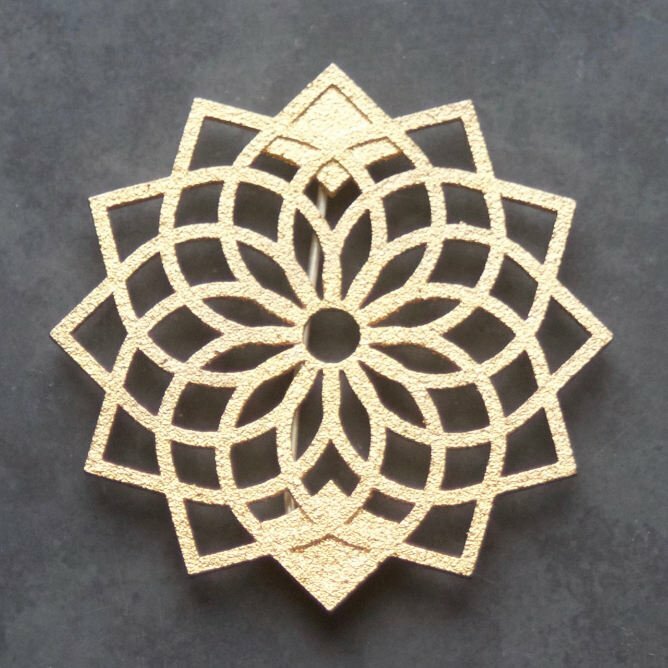 Printed directly into steel, this modern & elegant, geometric, filigree, floral brooch is lightweight yet strong. 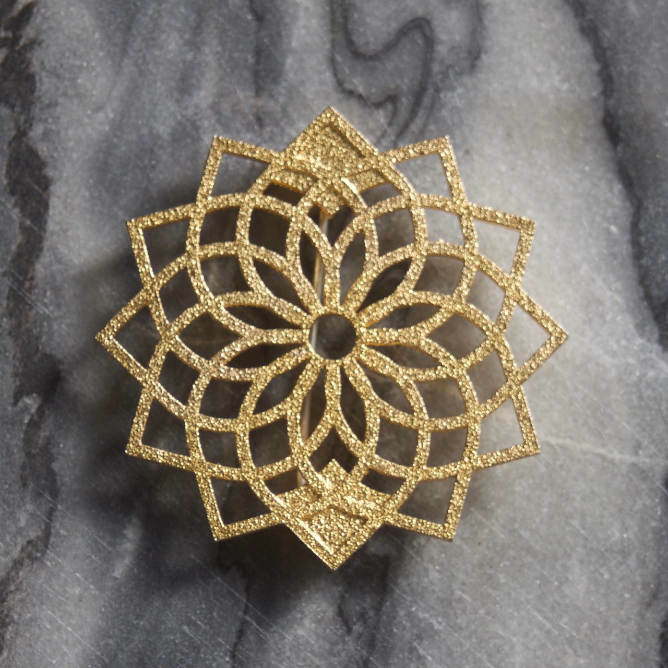 3D Printed, gold coloured steel brooch – part of the QUATREFOIL range. 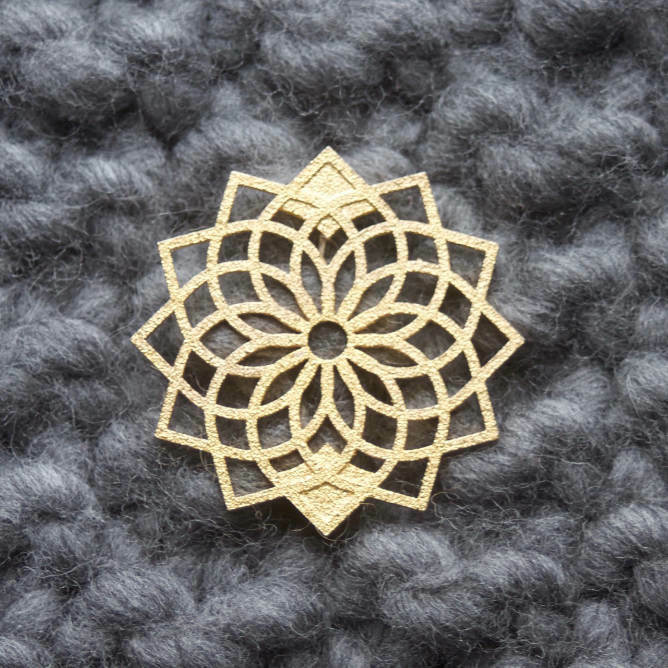 A simple and elegant shape, with a gorgeous, light, sparkle texture, is lightweight enough to wear on a scarf, or through chunkier knitwear. 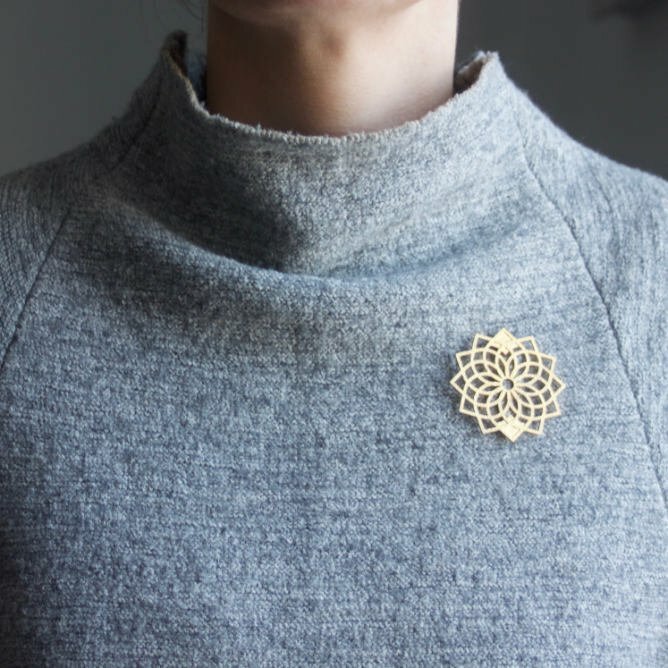 The brooch is part of a series of patterns I’ve created with CAD, based on a single shape, multiplied and manipulated, before being printed directly in steel and plated in a gold colour. The hand-crafted pin on the back is made of sterling silver and has been shaped and polished down to an elongated but rounded point – this ensures it doesn’t tear any fabric it goes through. It also sits quite close to the front so the brooch won’t stick out when it’s worn. It can go through loftier knitwear as shown, but also works on slightly finer fabric. To hide the pin completely when it’s worn, push as much fabric through as the length of the pin. In 2014, following a 15-year career in fashion buying in London, Lisa Crockard made the decision to move back to Scotland to complete an HND in Jewellery in 2016. Having previously studied textile design at Glasgow School of Art, Lisa has always had a passion for design & a love of beautifully made products. The opportunity during the HND course to use a variety of modern technology along with learning traditional silversmithing techniques means Lisa now uses 3D printing & CAD with old techniques such as the Korean practice of keum boo (which translates as ‘attached gold’), reticulation & lost-wax casting to make contemporary, elegant jewellery. Working mostly in sterling silver, gold & steel with semi-precious stones & minerals such as tourmaline, pearl, onyx & howlite, the aim is to produce elegant pieces that are either easy to wear every day, or intended to make a statement. Lisa designs and makes each component & piece, with the 3D printed steel components being manufactured on behalf of Lisa using specialised equipment in the Netherlands. Using architecture, man-made objects and geometric patterns as her initial source of inspiration mean that Lisa is always developing her series of designs as well as creating bespoke & custom pieces. In 2014, following a 15-year career in fashion buying in London, Lisa Crockard made the decision to move back to Scotland to learn a new skill. After completing an HND in Jewellery in 2016, at City of Glasgow College, Lisa set up her studio to produce and create contemporary jewellery from her hometown of Paisley. Having previously studied textile design at Glasgow School of Art, Lisa has always had a passion for design & a love of beautifully made products. The opportunity during the HND course to use a variety of modern technology along with learning traditional silversmithing techniques means Lisa now uses 3D printing & CAD with old techniques such as the Korean practice of keum boo (which translates as 'attached gold'), reticulation & lost-wax casting to make contemporary, elegant jewellery. Working mostly in sterling silver, gold & steel with semi-precious stones & minerals such as tourmaline, pearl, onyx & howlite, the aim is to produce elegant pieces that are either easy to wear every day, or intended to make a statement. Lisa designs and makes each component & piece, with the 3D printed steel components being manufactured on behalf of Lisa using specialised equipment in the Netherlands. It was using this process that Lisa won the opportunity to produce the awards given to the winners of the Scottish Album of the Year in 2017.